I’m not a big believer in heroes. There are obviously people I admire more than others, and some who have certain exemplary character traits that I can only hope to channel. But for the most part, in a paraphrase of the guy pictured below, people should not be placed in heaven or in hell, but here on earth, where they belong. Here on earth, where they are a jumbled mess of admirable and unfortunate traits, many of which are two sides of the same coin. No one can stand too far above anyone else. 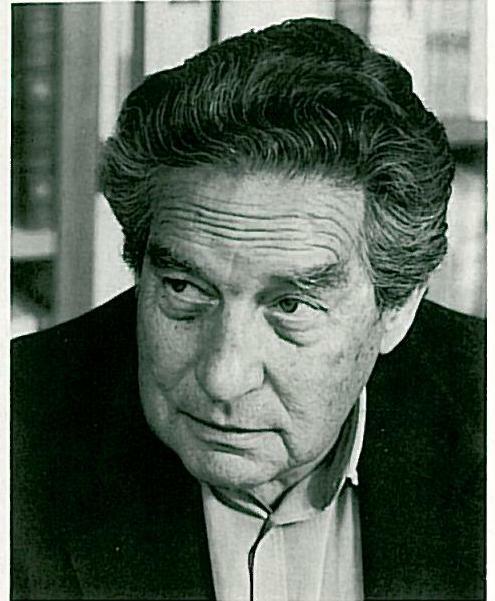 One who does stand a bit higher, though, is Octavio Paz, who was born 100 years ago today. Paz led one of the richest lives of the twentieth century. First and foremost he was a poet, but he was also a diplomat, an essayist, and a philosopher. By the end of his career, he was the mandarin of Mexican intellectual life, collecting awards left and right before finally claiming a Nobel Prize in 1990. He became the epitome of a public intellectual, and he took that mantel seriously, refusing to kowtow to anyone or anything. He was no ideologue, yet he had his principles. After the Mexican government massacred student protesters in 1968, he resigned his post as Ambassador to India. At a time when the Mexican academy was almost completely uniform in its Marxist orthodoxy, he came to be a fierce critic of the Soviet Union and of all authoritarian socialism. This made him persona non grata in Mexican intellectual circles, but he challenged it at every turn, and he lived long enough to see most of his theses proven correct. Paz defied definition. He was fascinated by dualities, contradictions, and dialectics, and held them all together in his head. He wasn’t overtly religious, but he spoke with much respect for Christianity, and for the religious and mythical human impulses. He was obviously no Marxist, but he was willing to say a few kind words about Marx, and thought socialism’s emphasis on justice ought to be rescued from the wreckage of communism’s collapse. At the same time, he denounced the anti-communist military juntas in Latin America. This led some to label him a liberal (in the Mexican and European sense of the word, meaning a capitalist who favored democracy and personal liberty), yet he made thorough critiques of the philosophical underpinnings of liberal society. The Marxist Mexican professor who introduced me to Paz dismissed him as “very conservative,” presumably due to his rejection of both the history and the materialism of Marxist historical materialism. While he certainly wasn’t a conservative in any contemporary understanding of the word, there are some vague aristocratic airs in his approach to the world—a certain delight in taking it as his plaything for further study. Anyone who tried to stick a label on him missed the point. You’ve said that Mexico is different from the rest of Latin America several times in this interview. How would you define mexicanness? The word “mexicanness” is one that I avoid. It strikes me as dubious. It traps a reality in motion in a prison of concepts and adjectives. Mexico is an invention that, like all inventions, has two sides, or faces: one is the discovery of a hidden reality, not visible at first glance; another is a design, a project. To discover what we are we need to question our past and examine our present but, at the same time, give a sense and a direction to that more or less static reality. The future is an essential part of our present. In that case, do you believe the famous Latin American identity is possible? What does it consist of? We cannot forget that history has always been tragic. Joyce said that history is a nightmare. No, history is a reality, but it is a reality that has the incoherence and the horror of a nightmare. Even so…Something from the past always remains. It’s very arrogant to condemn our ancestors: they don’t need simply our judgment, adverse or favorable, but our faith. And faith means sympathy: maybe I would have done the same as you, if I’d been there. There’s a norm we’ve forgotten: respect the adversary and honor the defeated. For a while I’ve rebelled against the official histories. Speaking of Latin America, but applicable to anything with a less-than-ideal past: I think our history–more precisely, that of the nineteenth and twentieth centuries–has been an immense failure. But defeat does not degrade; the real degradation is not knowing what to do with the defeats. Turning a failure into art is beautiful. We’ve made a few very admirable things out of our failures: a handful of poems, a half dozen novels and collections of stories. Moreover, we’re not dead: we’re a living culture. This has been a great triumph. Latin America has character; it has a soul. This is our great victory. He who rides a burro [common people, that is] doesn’t believe in utopias nor in ideologies. He believes in heaven and hell. Utopia is a disease of the intellectuals, not the people…I don’t lament the end of the myth of revolution. It lived for three centuries and left us both admirable and abominable things; but it has lost all its power. Now it’s not even a ghost: it’s a relic. What we need to do now is clean the dust off our minds with the feather duster and the broom of critiques, not with hysterical moaning about the end of the utopia…Today we don’t have anywhere to take refuge; we’ve run out of universalist ideologies and we have to reinvent everything. A great loss? More like an enormous possibility. Today a universal relativism reigns triumphant. The term is contradictory: no relativism can be universal without losing its relativity. We live in a logical and moral contradiction. Relativism has given us many good things, and the best of these is tolerance, the recognition of the other. Although I have no nostalgia for the old religious and philosophical absolutes, I’m aware that relativism–apart from its intrinsic philosophical weakness–is an attenuated form and in certain ways hypocritical of nihilism. Our nihilism is surreptitious and is coated in a false universal benevolence. It’s a nihilism that doesn’t dare say what it is. I prefer cynics, I prefer Diogenes in his barrel. A relativist society doesn’t admit what it is: a society poisoned by the lie, a slow but certain venom. The remedy, perhaps, requires a return to classical thinkers. If we think of that trio upon which the modern world was founded–liberty, equality, fraternity–we see that liberty tends to turn into tyranny over others; thus, it needs to have limits; and that equality is an impossible ideal that cannot come to be without the use of force, which implies despotism. The bridge between these two is fraternity. …if we don’t rediscover fraternity, we’ll come to the real devil: the Last Man. Happiness is not, nor can it be, terrestrial. Nor can it be a permanent state. Humans can be happy but for an instant…But its brevity does not matter: an instant can be a window unto eternity. If you read Spanish, the wonderful Nexos Magazine has a great series of reflection pieces here.